This app is for learning Hungarian. Perfect for beginners and travelers. The app contains flashcards of Hungarian and English phrases in 53 subject areas such as business, visiting the airport, doctor, hotel, taxi, restaurant, making friends, numbers, shopping, national anthem, food, animals, bus, and many others. 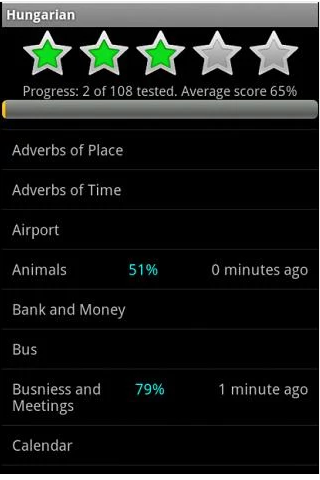 Also covers 20 grammatical categories and 30 verb conjugations in most verb tenses. Pronunciation is made easy with a phonetic spelling of each Hungarian phrase. Your learning progress is rated in a test yourself module. This way you can tell if you need more studying to master a subject area. Try to score 100% to get 5 stars! Also available are 2 exciting fast games to make learning hungarian fun. The matcher game tests your memory by having you find hidden pairs of Hungarian and English phrases behind boxes before the clock runs out. The slider game tests your hand eye co-ordination by clicking on matching phrases sliding quickly across the screen before the time’s out. Don’t wait. Try them out now!